The African Savanna is the first stage of A Wilder Vision. Sitting on 10 acres of Zoo land, the Savanna allows guests to see giraffes, springbok, ostriches and more in one exhibit. This habitat is surrounded by shaded walkways and an aviary with a variety of bird species for Zoo visitors to discover. A hippo exhibit includes spectacular above-water and underwater viewing. The exhibit also includes an elevated deck for giraffe feeding, restaurants and shaded viewing areas, private event space and much more. Click here to learn more about African Savanna. Asian Falls is nestled in an existing hillside at the southwest end of the Zoo. Guests can choose to view the exhibit via two paths that begin across from Meerkat Mounds. The lower path guides guests right next to the greater one-horned rhinoceroses. An upper path leads guests on a boardwalk that provides a bird's eye view of the Asian elephants and the greater one-horned rhinos. Both paths intersect at the top of the hill, leading onlookers past exotic bird species and toward two big cat favorites: the Malayan tigers and the white tiger. The Zoo's two tiger exhibits are pictures of paradise, outfitted with green fauna and a striking waterfall. No need to travel halfway across the globe in order to view the wonders of Australia’s wildlife. 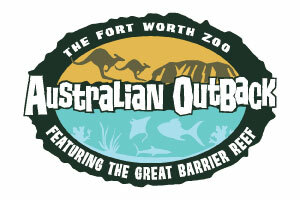 The Fort Worth Zoo brings Australia’s aquatic and terrestrial animal species to guests in its Australian Outback and Great Barrier Reef exhibits, located across from the Zoo Creek Cafe. Australian Outback is home to several species of Australian birds and a group of red kangaroos. The large marsupials spend their days snoozing in the sun and bouncing through their habitat. Zoo visitors can go to the depths of the Coral Sea at the Fort Worth Zoo's Great Barrier Reef, an aquatic exhibit with three saltwater tanks containing more than 10,000 gallons of water. Australian aquatic wildlife including vibrant fish, eels, corals, small invertebrates and blacktip reef sharks are showcased for a close-up encounter. 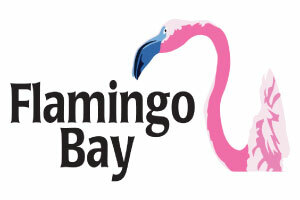 Flamingo Bay is home to more than 70 flamingos. This exhibit has three of the world's six flamingo species on display: Caribbean flamingos, Chilean flamingos and lesser flamingos. In the spring and summer months, guests may spot flamingo chicks in the exhibit. The Zoo's bird department has had immense success with its flamingo captive breeding programs. The Fort Worth Zoo is one of a handful of institutions to successfully breed and hatch Chilean flamingos in captivity, and the Zoo has been the No. 1 lesser flamingo captive breeding facility in the world since 2002. The Fort Worth Zoo’s, Museum of Living Art (MOLA), a premier, award-winning herpetarium, brings guests eye-to-eye with some of the most exotic and endangered species on the planet. Each facet of MOLA is a piece of art — from the life-like, hand-painted murals on the exhibit walls to the 5,000 reptiles, amphibians and more that are living, breathing works of art. The 30,000-square-foot indoor/outdoor facility houses more than 250 amphibian and reptile species, representing more than 5,700 animals. Upon entering MOLA, guests see North America’s largest saltwater crocodile, measuring more than 15 feet long, in its "oceanfront" exhibit. Other crowd-pleasers include the Zoo's 15.5-foot Burmese python, Fly River turtles, yellow-spotted climbing toads and a king cobra, all housed in bright, natural habitats with one-of-a-kind mural and rock work in each exhibit. The Zoo's Komodo dragons reside in indoor and outdoor exhibits, complete with a dirt bank ideal for digging holes and laying eggs, and a pool that's perfect for basking in the sun. Open encounter areas encourage discussion and education and allow guests to come face-to-face with exotic reptiles such the Fiji Island iguana or the Puerto Rican crested toad. Complete with educational programming and correlating activities such as backpack tours and keeper chats, MOLA also shares messages of environmental stewardship with guests, students and teachers throughout the Dallas/Fort Worth Metroplex. Parrot Paradise is a walk-thru aviary that invites guests to get an up-close experience with wildlife. Inside the domed structure, hundreds of cockatiels and parakeets soar through the air, coming to rest on whatever looks like a comfortable perch – from tree branches to baseball caps to shoulders. Guests also have the option to buy a seed stick to feed the birds. Located on the upper path between Raptor Canyon and the African lion exhibit, the Parrot Paradise area has a long history at the Fort Worth Zoo. The exhibit site was originally built in 1937 with funds from the city and Works Progress Administration, a federal program that created jobs during the Great Depression. It first opened as Monkey Island and was home to 30 rhesus monkeys. In 1949, Monkey Island became a sea lion pool. In 1970, small South American mammals moved into the space. In the 1980s, storks and cranes inhabited the area, and in the early 1990s, the exhibit was converted into an alligator exhibit, where American alligators lived until they moved to Texas Wild! in 2001. The area was vacant until June 2004, when Parrot Paradise opened to the public. The Zoo's Penguins exhibit opened in 2008 and has both indoor and outdoor viewing areas available to watch these feathered friends. The outdoor portion of the exhibit once housed the Zoo's gharials until they moved to their new habitat at the Museum of Living Art (MOLA). Today, the outdoor area is home to a group of African penguins. Though most people think of penguins as cold-weather creatures, African penguins are native to the southwestern coast of Africa. The birds are accustomed to warm temperatures, so the Texas heat feels like home. Guests can walk right up to the glass and watch as the penguins swim in a large pool. Southern rockhopper penguins can be found in the indoor Penguins exhibit. Large panels of Plexiglas give vantage points both above and below water. Watch the penguins waddle across the rocky terrain, or get an underwater view as they gracefully slice through the water. Raptor Canyon introduces Zoo guests to seven species of raptors. A heavily shaded path winds through the exhibit, immersing guests in the birds’ habitats. Each habitat extends high in the trees and, in some cases, overhead. A mesh barrier between guests and the birds facilitates easy viewing. All the residents of Raptor Canyon are magnificent creatures, and some of them are endangered. Birds on exhibit in Raptor Canyon include the African crowned eagle, Andean condor, milky eagle owl, king vulture and harpy eagle. Did you know that Texas is home to more animal species than any other state in the nation?Texas Wild! celebrates the state we all love and the wildlife that shares the land with us. Opened in 2001, Texas Wild! paints a picture of the Lone Star State by leading visitors through the state's different regional landscapes. By the time guests finish their tour through the exhibit, they can say they've seen Texas in a day! This exhibit is highly focused on wildlife conservation, educating visitors about what is being done right now to conserve Texas wildlife and steps that need to be taken in the future in order to retain the state's natural beauty. As visitors travel through Texas Wild!, they are challenged to become stewards of the land. The eclipsing message is one of coexistence; that is, finding a way to live peacefully with wildlife in ways that benefit everyone. The pyramid that pierces the sky at the peak of the World of Primates exhibit is the first sight that most people first notice upon entering the Zoo. Inside the exhibit, a huge tree in the center of the gorilla habitat stretches to the ceiling. Waterfalls trickle throughout the rainforest habitat. Around the perimeter, black-and-white colobus monkeys leap and play with their white hair flowing behind them. The Zoo's bonobos (an ape species similar to chimpanzees) also have an indoor habitat. Outside, the World of Primates stretches even further, providing habitats for orangutans, mandrills and white-cheeked gibbons. Another troop of gorillas lives outside in a lush forest habitat. The bonobos have a large outdoor area as well. 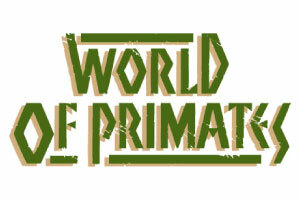 Primates are known for being active and entertaining. The gibbons display impressive speed and artistry as they swing through their jungle-gym-like structure, and the orangutans like to make a toy out of an unlikely item: burlap sacks. Whether guests are inside or outside, there is plenty to see across the 2.5 acres of the World of Primates.